VANCOUVER — They played each other way back in Week 1 so one team had to lose. Since then, it has been all victories. 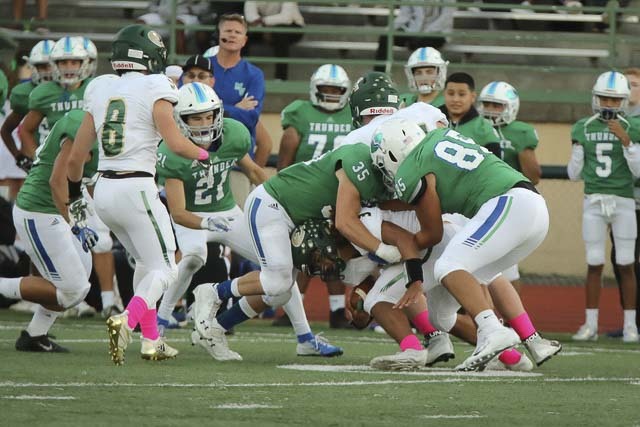 The Union Titans and Mountain View Thunder hope this is just halfway through the season, now seven weeks into the 2018 campaign. On Thursday night, Union got the shutout over Heritage 34-0 to remain undefeated. Earlier at McKenzie Stadium, Mountain View won its sixth consecutive game, taking down Evergreen 55-14. The two teams are a combined 13-1. There are 14 weeks in Washington high school football for teams that make it to state championship weekend. Union is ranked No. 1 by The Associated Press in the Class 4A poll. Mountain View is No. 5 in the 3A poll. 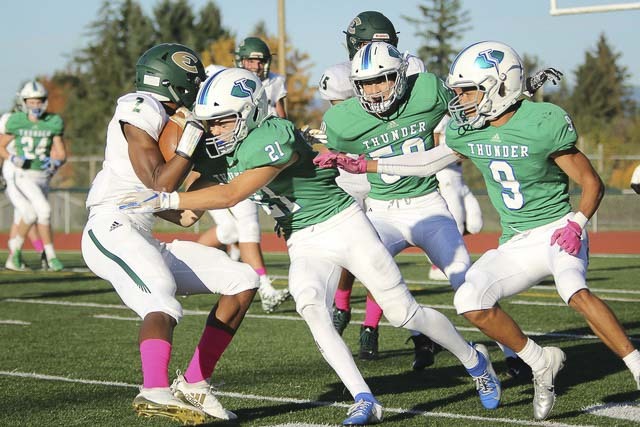 So yes, seven weeks into the season, it is not such a crazy notion to believe two teams from Evergreen Public Schools could be making long playoff runs. “It feels like we’re unstoppable, like nothing can get past us,” Mountain View linebacker Andrew Gulliford said. The Thunder have outscored opponents 335-38 since losing to Union 17-14 in Week 1. Union is 7-0, playing a crazy tough schedule but figuring out ways to win a number of close games. 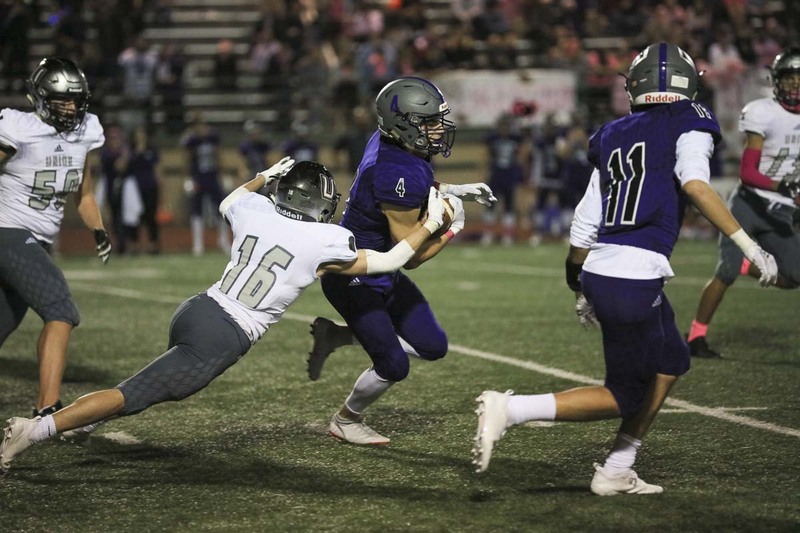 The Mountain View defense had given up less than 1,000 yards in their first six games. Still, the Thunder know they cannot take anything for granted. They certainly will not be thinking beyond next week when they take on undefeated Kelso in the game of the year in the 3A Greater St. Helens League. Union has not had the luxury of too many blowouts. Even Thursday’s game was close at halftime. Of course, the Titans suffered through a tragic week following the death of offensive line coach Mark Rego. There was a moment of silence before the game in Rego’s honor. “We were grieving the loss of a friend and a coach,” Union coach Rory Rosenbach said. At the same time, Rego would hope the Titans learned a lesson. “You’ve got to prepare every week,” Rosenbach said. “If you don’t prepare every week or show the same hunger you had earlier in the season, teams will sneak up on you. Hopefully they got the message. The Union defense got its first shutout of the year, too. “It’s just practice,” Chin said. “We always focus on the details, all the little things. The little things matter in the end. The Union defense set up the first score of Thursday’s game, recovering a fumble at the Heritage 1-yard line. The next play, the Titans gave the ball to lineman Giovanny Rojo for a touchdown run. The Titans made it 14-0 when Alishawuan Taylor, normally a wide receiver, found Jojo Siofele for a 30-yard touchdown pass. Taylor started at quarterback for the injured Lincoln Victor. Taylor was one of five Titans who played quarterback in the game. “We got a lot of guys a lot of reps,” Rosenbach said. Victor, by the way, was held out for precautionary reasons. He expects to return to the field soon. Siofele scored on a 62-yard touchdown run on the first play from scrimmage in the second half to make it 21-0. Darien Chase caught a TD pass from Ryan Rusumny. Nile Jones capped the scoring with an 18-yard touchdown run in the fourth quarter. Mountain View put on its usual show on offense in the early game at the stadium. Jack Mertens rushed for 150 yards on just nine carries and scored three touchdowns. Quarterback Garrett Moen threw three touchdown passes and rushed for another. Gulliford and Mountain View coach Adam Mathieson said the Week 1 loss to Union has been beneficial. The Thunder are good. The Titans are good. There are no guarantees from any player on any team, but they are so good, in fact, that it is possible that they have only reached the halfway point of the season at Week 7. 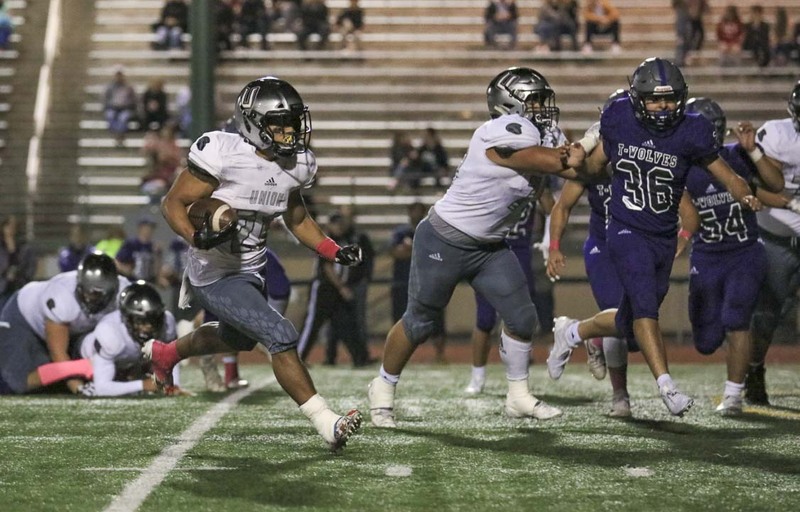 RUSHING — Evergreen: Vaa-leiataua 19-81, Zyell Griffin 3-12, Cam Smith 1-3, Ryan Blaize 1-(minus 1). Mountain View: Mertens 9-150, Moen 7-93, Bobby Shepard 1-8, Batties 6-36, Xavier Mayo 2-19, Alec Cann 5-20, Juan Jimenez 1-(minus 4), Team 3-(minus 8). PASSING — Evergreen: Blaize 14-22-2-201. Mountain View: Moen 8-12-1-180, Kury Santiago 2-2-0-47. RECEIVING — Evergreen: Vaa-leiataua 2-6, Tae Marks 3-18, Griffen 5-101, Jaylen Fite 1-24, Isaijah Griggs 3-52. Mountain View: Anderson 1-29, Bolds 2-27, Earnhardt 4-125, Colton Drake 1-(minus 1), Dominic Stephens 2-47.